Happy Father's Day! I hope everyone had a great weekend and go to spend sometime with their dad. I know that everyone thinks their dad is the BEST in the world...and I am no exception! My dad has always been there for me and supports me in everything I do. He wants nothing except for me to be happy and he's always willing to do what needs to be done so I can be happy. He's a great role model and does so much for the community. Without knowing who my dad is, you'll have no idea how truly great and inspiring he is. This is also the first Father's Day without my grandpa. I think about him everyday. He always said we were simple people and it was never to be about us and what people can do for us, but instead about what we can do to serve the communities we are a part of. This week I've also decided to participate in Sunday Social. It is so hard to pick one! I'm not a huge movie (thank you University film courses) fan but I do have a handful of movies that I do love. I'm going to answer this question with the movie that was my first favourite: Cinderella! I am horrible at remembering movie quotes! So, I can't recall any quotes at the moment. My favourite movie tagline comes from Chicago: If you can't be famous, be infamous. Something funny and lighthearted, like Mean Girls or Legally Blonde or Bridesmaids. Now and Then is also a good girls night in movie. Zoolander! It's so funny that it makes you forget about the breakup for a bit. This movie is guaranteed to make you laugh and laughing after a breakup is key. 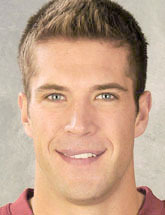 Taylor Pyatt...not really a celebrity, but a professional athlete (NHL). I just watched Mean Girls the other day for the first time in forever! I love that movie! I love Legally Blonde--it's definitely a classic girl's night movie! I'm so sorry to hear about your grandfather, I know that must be hard. It sounds like you and your dad are close, though, so I'm glad you had a wonderful day spending time with him. and what an amazing man your grandfather must have been..you are lucky he was in your life! I love his life perspective!